Oreo is one tough cookie. Don't let her sweet and friendly demeanor fool you into thinking she is a push-over. She is strong, and she is tenacious, and I learned that the hard way. When Irma called me about Oreo, it was late in the afternoon, and, from what she told me about Oreo, I thought this would be a quick rescue. Maybe, if I rushed, I could get it done before dark. But then she told me about the power lines running through the tree. I do not want to be trying to rescue a cat near power lines in the dark, so, since Oreo had been in the tree only one night so far, I told her I would be there in the morning. When I arrived at the site that morning, I was not prepared for what I saw in the backyard. There was a short portion of a tree that had been previously trimmed to avoid the power lines above, and this tree had since grown numerous limbs and sprouts that reached up into the power lines. Accompanying those limbs was a large mass of dense vines that were also growing up into the tree and power lines. The lowest two power lines, which are black and insulated, are for the phone and cable TV signals. There were four uninsulated power lines progressively higher above those. Oreo was not in the tree. Instead, she was resting on top of the insulated phone line. Her body was aligned with the wire, and she had the support of the limbs and vines growing around it to help support her and keep her balanced for her high-wire act. The two lower insulated lines for the phone and cable TV signals are not dangerous. In no way am I encouraging anyone to regard them lightly by any stretch of the imagination, but as the cat was proving, in general, she could touch the line without being shocked. The dangerous lines, however, were the uninsulated ones above it. Quite simply, those are deadly. 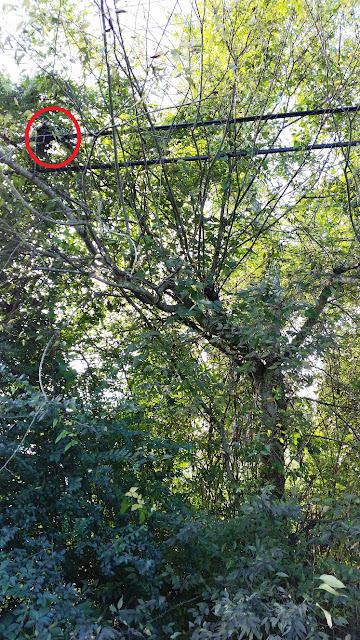 If any part of a tree makes a good enough contact with those lines, the current can flow through the sap to the ground and potentially electrocute any cat or person in contact with the tree. So the sprouts of the tree that were growing up into those lines were of great concern to me. Since the cat was in contact with the tree and doing just fine, it was clearly safe to touch the tree at this moment. 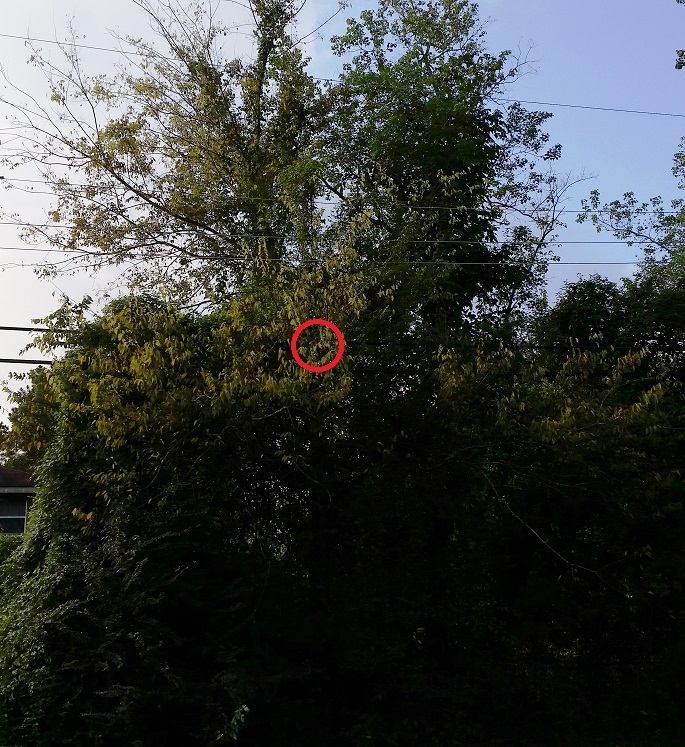 However, if I were to try to climb the tree and cause a branch to move slightly, or if the cat moved a small branch by stepping on it, or even if the wind blew the right way, those sprouts around the power line could possibly contact the wire in just the right way to be deadly. Climbing this tree is out of the question. There was very little of the tree that was climbable anyway, but it could have made it possible to get close enough to Oreo to either encourage her to come down or to grab her with my net. But without the tree to climb, I could think of only one way to rescue her. I would have to try to scoop her up into my net from the ground using my non-conductive, fiberglass extension poles to reach her. I spent most of my life as a young person, so it is sometimes difficult to remember that I am not young anymore. I don't have the strength and stamina that I once had, so holding a 20-foot long net up high and trying to scoop a cat into it is very tiring. Making it more difficult were the numerous limbs and vines that pushed against the net or at least interfered with where I wanted to place it. Oreo, of course, resisted my every move with all her strength and was trying to avoid falling. I was trying to get her into the net, of course, but I would have been satisfied if she fell, since it was not a long fall and the ground below her was soft. In fact, it appeared that the only way I was going to get the net under her from this angle was to push her off the wire and then move the net under her while she was dangling. It was difficult to get her off balance because all the limbs and vines around the wire gave her some support and balance. If she were to go out away from the tree and vines, then it might be easier. Indeed, she did go out a bit, and then I had my best chance yet to net her. I have to hand it to Oreo, though. No matter what I threw at her, she always managed to recover, and she headed back to the relative safety of the tree and vines. We were both exhausted. I was sweating buckets and had to stop to catch my breath. So did she. We were both getting weaker and finding it harder to battle. We battled some more, and we stopped to catch our breath again. We battled some more, and again we had to rest. At last, I finally got her dangling by her front legs on the wire, and all I had to do was move the net under her to catch her. But those damn limbs made it impossible for me to move the net into position. I had to pull the net out of the tree and re-insert it into position to get there, but before I could do that, Oreo fell to the ground. 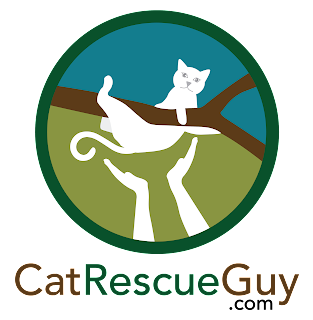 When cats fall out of trees, they almost always hit the ground running. Not Oreo. She stayed right there where she landed and didn't move. She was standing, but I think she was just too exhausted to run. I backed off and began walking away from her to make sure she knew I was not after her. I did not want her to run away. I walked all the way to the front yard and peeped at her every now and then to see what she would do. After a few minutes, when she felt safe and had regained enough energy, she began walking back to the house. I knocked on the door so that the people would open it for her. They opened the door, and Oreo walked straight inside. She was finally safe. I was still panting as I gave them some canned food with water added to feed her. She needed a lot of water and rest, and I wanted to be sure she got off to a good start. I packed up and left with soreness in my shoulders that I hope is not indicative of an injury. And I hope I don't get another call for a rescue for the next few days at least, because I need that much time to recover from this one. I got no video and very few pictures. 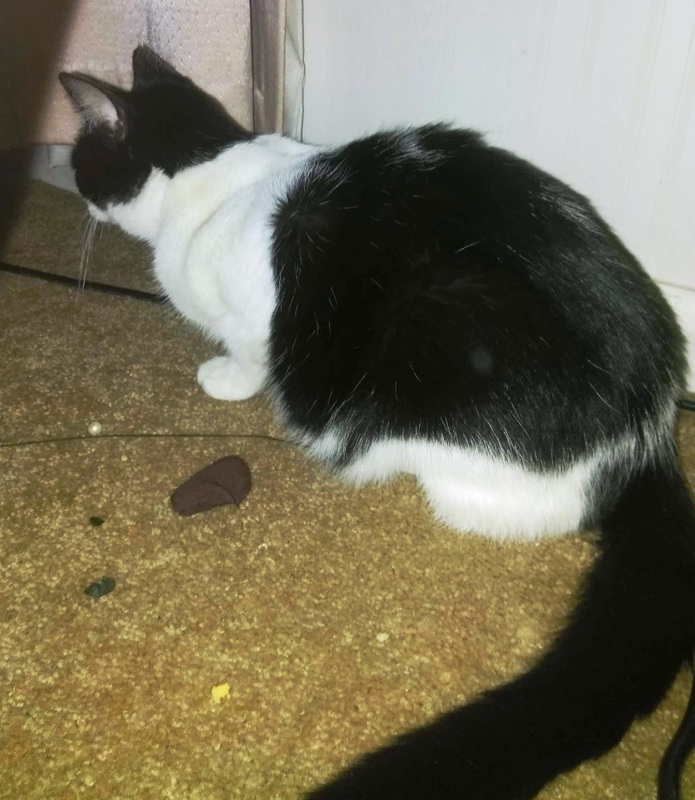 It was Irma who sent me the only picture I have of Oreo. Thank you, Irma. Take care of that sweet Oreo. I don't ever want to see her in those power lines again.